It's really starting to feel like fall with the cooler temps and leaves starting to change color. In our house, fall equals lots of soups. 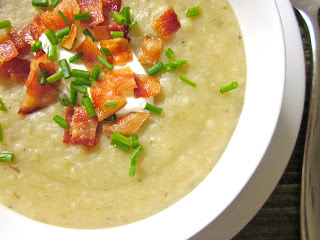 We have tons of leeks in our garden and my favorite way to use them is in potato-leek soup. But I didn't want this to be your usual potato-leek soup (although that recipe is sure to come sometime soon). Here, your typical russet baking potato is roasted and caramelized along with leeks and garlic, and turned into a thick, creamy soup topped with all the favorite baked potato toppings. The soup was so good that I couldn't stop myself from taking those "little tastes," you know, to make sure the seasoning was right. And that was without the toppings! Preheat the oven to 400°. To clean the leeks, place the chopped leeks in a large bowl of cold water and stir (the sediment should sink to the bottom). Carefully skim the clean leeks off the top and dry on a paper towel. Transfer the leeks and potatoes to a baking sheet. Drizzle with olive oil and season with salt and pepper. Stir to coat. Cut the top (about 1/3) off of the garlic head and remove the excess paper skin. Discard the top and drizzle olive oil over the remaining 2/3. Wrap tightly in aluminum foil and place on the baking sheet with the potatoes and leeks. Bake the potatoes, leeks, and garlic for 40-45 minutes, stirring after 20 minutes, or until the leeks and potatoes are golden brown. Remove the garlic from the foil and allow to cool slightly. Gently squeeze the garlic cloves out of the skin and rub into a paste with a knife. In a large pot or dutch oven, heat the butter over medium heat. Add the roasted potatoes, leeks, and garlic paste. Cook for a couple of minutes over medium heat until fragrant. Add 4 cups of chicken broth and bring to a simmer over medium heat. Simmer for 10 minutes. Using an immersion blender (or add to a regular blender in batches), puree the soup until smooth. Add additional broth as necessary to reach the desired consistency. Season with salt and pepper to taste. Top with your favorite baked potato toppings.